You are currently viewing all classes sorted by teacher's name. 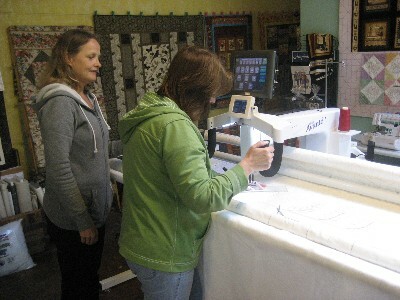 Basic Embroidery Machine class will be from 9:30-3pm for $45. Brenda will teach you how to use the embroidery part of your sewing machine. ANY BRAND! This class covers: using the proper stabilizers, how to hoop properly, discuss needles, threads, bobbins, machine, downloading designs from the internet, and designs organization on your computer. Bring your machine and laptop for hands on instruction for your machine. Now is the time to learn to use your embroidery machine! We have kept our ears open as customers discuss teachers. Brenda comes highly recommended by several different groups. She has many samples to show and inspire you to use your embroidery machine in your own quilting projects. Class supplies needed: embroidery machine cleaned and ready to use, bring owner’s manual and the 5x7 stitch field hoop (if you are in doubt as to your hoop size bring all hoops) and remember your power cord. Strip of white or ecru fabric cut at 13” by the width of fabric, use a good quality of cotton fabric, it will make a tremendous difference in the quality of your stitch out. 2 pieces cut-away stabilizer, if you don’t have or not sure what you need this stabilizer it can be purchased at Quilt Mercantile the day of the class. 2 filled bobbins for your machine that have white bobbin thread on them, this would be a 60 wt. thread. If you have a question about your bobbin thread contact Brenda Jeschke. If your embroidery machine uses a USB drive then bring one no larger than a 2GB, if your embroidery machine uses a reader card be sure to bring the reader box. you will need a collection of machine embroidery thread, it should be polyester if you have some but if you have rayon thread you can use it. Bring a can of adhesive spray, if you do not have have one don’t worry. Will discuss the usage of this spray during class. BASIC TOOL KIT -- this should include small curve-tip scissors and pin-point tweezers, and there will be more tools discussed during class but these are must have tools for the class, if you don’t have these two items they will be available at Quilt Mercantile. Bring your laptop computer (if you can), paper and pencil for notes, and any questions or issues you may have. *** If you have any questions about what you need for class, please contact Brenda before class at (903)536-4101 or email brenjj56@gmail.com. This class will teach you about tension, thread and batting. 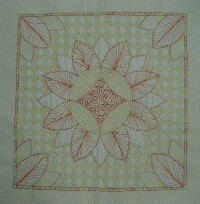 You will also learn basic steps on how to stitch a nice pantograph pattern design on your quilt. 1.Making sure your tension is set right2. 2.Choosing the right thread type and thread color for your quilt.3. 3.Batting choices4. 4.Centering the quilt5. 5.How to set you’re quilt up for pantograph quilting. 6.Tips on using the Lazar light.7. 7.The last row of your pantograph design is a step you will need to learn to finish the quilt. a.Top 36x36 – Muslin fabric is good choice of fabric for the top. b.Back 44x44 c.Batting 44x44 d.Thread e.Note pad and pen Call to set an appointment with Jackie. You will learn one of the most important steps about custom quilting. You will also learn how to use templates, how to stitch in the ditch, crosshatching, feathers, echoing, and small stippling. 1.Stabling your quilt – This needs to be done before you start with custom quilting. 2.Templates – You will learn how to use different shapes and sizes. 3.Stitch in the ditch - With tips on how to stay in the ditch. 4.Feathers – So many ways to make feathers. 5.Echoing - Used as a background fill to enhance a stitched design or appliqué. 6.Crosshatching - So many types and sizes to make an area stand out. 7.Small Stippling – A small background fill. 8.Piano Keys – Simple design that can be striking on a busy fabric. a.Top 36x36 – Muslin fabric is good choice for the top. 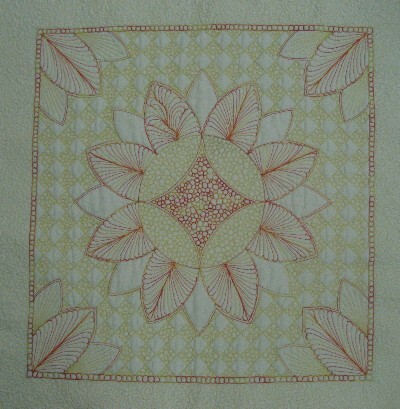 b.Back 44x44 c.Batting 44x44 d.Thread e.Note pad and pen Call to set an appointment with Jackie. Every quilt has a story to tell, and everyone is different. There are so many decisions to make when quilting a quilt. I will look at the story in your quilt and help you decide the best designs for your quilt. 1.You will bring a quilt top that you want to quilt in the near future. I will give you some of my thoughts and ideas on quilting designs for your quilt. 2.36”x46” muslin fabric 3.42”x48” muslin fabric for the backing 4.42”x48” batting 5.Thread 6.Note pad and pen 7.You will mark in class the top of the muslin representing blocks from your quilt. We will load it on the machine, and you will practice stitching designs suggested for your quilt. Call to set an appointment with Jackie. In this Class you will learn how to move the fabric with the speed of the needle to get even stitches. I will teach you how to cross hatch, stipple, basic feathers, background fills, and how to us the quarter inch thick rulers. 1.You will need 2	16”x16” muslin fabric for the top 2.You will need 2	17”x17” muslin fabric for the back 3.You will need 2	17”x17” batting 4.Thread 5.Pen and Paper Call to set an appointment with Jackie. Dear Jane is the ULTIMATE Sampler! Join the craze known as Dear Jane...recreate this Civil War era quilt with it's small, interesting blocks and triangles, mainly by machine with applique blocks by hand. This class is taught by technique and you are guaranteed to come away learning a shortcut or two, and/or new techniques. Let Sarah help you with fabric selection. She will take all the "wonder how she made that one" out of it for you. Dear Jane book required. Dear Jane book, DJ Software is optional-but is helpful if you like to paperpiece (BTW-I don't like to paper piece but we do it in class. ), Dear Jane rulers--square and triangle, 4" or 6" square with diagonal line for squaring up half square & quarter square triangles (1 prefer Omnigrid), 96 or 96L triangle, Add A Quarater ruler-6" or 12" length (if buying only 1 ruler, buy the 12" for the triangles), Roxanne's Glue Baste It, No Melt Mylar, Freezer paper, Striaght pins-Clover Article No. 2507-Patchwork Pins (Fine) 0.4 mm. (These are what I prefer. They are very fine and don't distort when machine piecing. ), scissors for reverse applique (don't buy until I show you, you probably won't find them), starch in container + paintbrush (I use spray starch and then spray into a small bottle with lid), Scotch Removable tape if you will be tracing patterns (it's in a blue box)...if you will be printing instead of tracing you don't need the tape.) 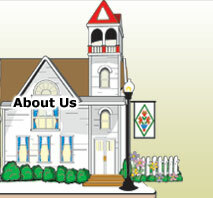 All this is in addition to your basic sewing supplies, rotary cutting supplies and sewing machine.